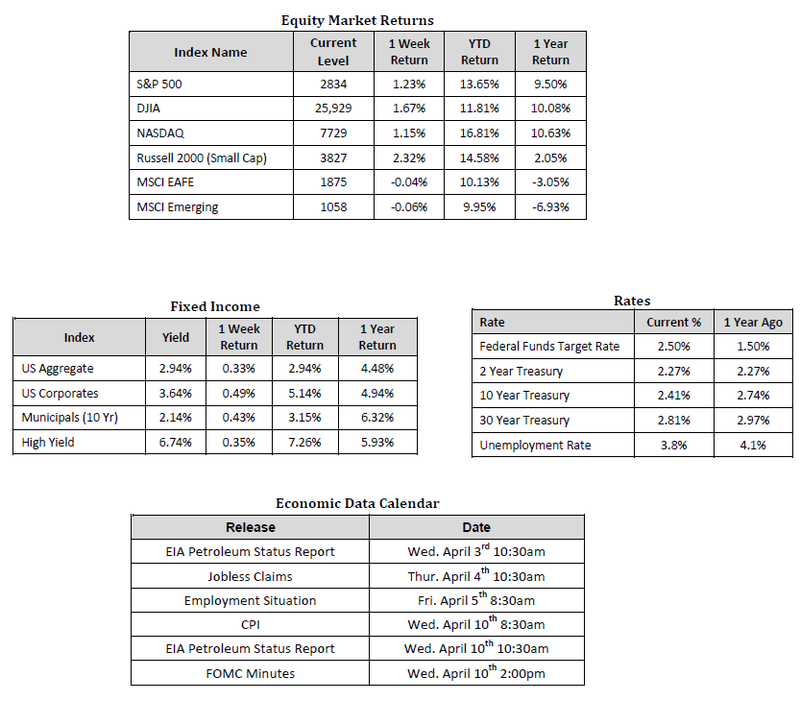 Sources: Sources for data in tables: Equity Market and Fixed Income returns are from JP Morgan as of 03/29/19. Rates and Economic Calendar Data from Bloomberg as of 04/02/19. International developed markets measured by the MSCI EAFE Index, emerging markets measured by the MSCI EM Index. Sector performance is measured using GICS methodology. From the onset we’d like to make clear that we do not believe the Federal Reserve is to blame for slowing economic growth, but before we dive into evidence supporting our stance lets first recap capital market performance for the week. In the U.S., the S&P 500 Index finished the week at a level of 2,834, representing a gain of 1.23%, while the Russell Midcap Index followed suit gaining 1.71% for the week. On the international equities front, developed markets gave back 0.04%, while emerging markets lost 0.06%. Finally, the 10-year U.S. Treasury yield continued its rapid descent lower and finished the week at 2.41%. As of late, we do not have to look far to find a financial news program chocked full of pundits arguing about what the best route forward is for the Federal Reserve. Such arguments have remained a constant throughout this entire economic recovery, but a new rally cry has started to take center stage in light of the recent slowdown in economic growth. Many have questioned whether the Fed’s pace of interest rate increases is to blame for the current, and expected future, slowdown in growth. It’s indisputable that a good many recessions have, in hindsight, been attributed to the Fed rapidly raising interest rates and essentially strangling future growth prospects. This is a fact, but it is our view that the current scenario presents stark differences. For one, quarreling that the Fed has pushed rates too high and to a level that restricts growth is to believe that real short-term interest rates (Nominal Interest rates – Inflation) are simply high. However, looking at this through a historical lens indicates otherwise. In fact, the federal funds rate has been higher 64% of the time over the last 60 years. Next, critics have stated that the Fed’s rapid pace of increases has been compounded by their dual prong approach for raising interest rates; raising the target overnight lending rate, in addition to reducing the size of their balance sheet. The former should place upward pressure on the short end of the curve, while the latter should lift the longer end of the curve. However, the real 10-year yield is currently lower than it has been 88% of the time over the past 60 years. Moreover, the pace at which the Fed has increased rates has actually been much slower than in previous rate-hiking cycles. The average annual increase in the federal funds in this hiking cycle has been 0.75%, compared to the historic average of 2.4%. Finally, surveys used to discern whether the lending standards of banks have tightened –a sign that interest rate levels have reach restrictive territory—have only registered slightly tighter lending standards. The takeaway here is that interest rates are not quite as restrictive as many in the media would have us believe, and the slowdown in economic growth can’t solely be pinned on the actions of the Federal Reserve, at least, for the time being. Regardless of who’s to blame, one thing is certain. Economic growth is slowing, which is why we encourage investors to revisit the diversification that may, or may not, be in place within their existing portfolios. If you would like to learn more about how we are helping clients invest dynamically and consistently with their own goals, time-frame and tolerance for risk, please do not hesitate to speak with your Hennion & Walsh Financial Adviser.